Be the first to share your favorite memory, photo or story of Israel. This memorial page is dedicated for family, friends and future generations to celebrate the life of their loved one. 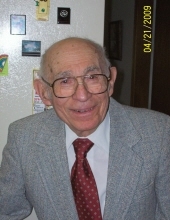 Israel (Izzy) Cooper, age 98, of Tomah passed away April 13, 2019 at Sparta Rolling Hills Nursing Home. He was born in Tomah February 6, 1921 to Joseph and Lena Cooper. He graduated from the Tomah High School in 1939 and UW-Madison in 1943 with an accounting degree. Izzy served in the US Army from 1943-1946, including Australia, New Guinea, Southern Philippines and Luzon. He was in supply management, and because of high school and college band experience had the chosen honor to play baritone in the US Army Band during his service. From 1947-1949 Izzy was an accountant with the Wisconsin Department of Revenue in Milwaukee, and married Evelyn Mislove in 1948. The Cooper Company had been operated by Izzy’s Father since the 1920’s, and continued as S&I Cooper owned by Izzy and his brother, Sammy from 1950-1991. The business survived due to diligent effort six days a week and extended work hours. Scrap metal was a major part of the business. Retail steel sales and fabrication became significant in later years. Other businesses at various times included: newspaper recycling and bailing, poultry collection and delivery to packing plants, and truck weighing. Izzy was on the Memorial Hospital and Forward Tomah Development Boards, and recent recipient of a 70 year Mason service award. Family, friends, volunteering, a Boy Scout cabin project, and community service were dear to Izzy’s heart. They donated items from S&I Cooper to the Tomah Parks & Recreation department and for high school plays. His strong interest in the relationships he created with the families in Tomah were near and dear to his heart. He was preceded in death by his parents, his loving wife, Evelyn of 61 years, and his brother, Sammy. He is survived by his sons, Anthony and Scott. The family wishes to express special thanks to the Rolling Hills Nursing Home staff, and to the many friends, family and community patrons that endeared Izzy’s life throughout the years. A Celebration of Life will be held at 1:00 p.m. Tuesday, April 30, 2019 with a masonic service beginning at 12:30 p.m. at the Torkelson Funeral Home in Tomah. Family and friends are invited for visitation on Tuesday, April 30, 2019 from 11:30 a.m. until the time of service at the Torkelson Funeral Home in Tomah. Memorials may be sent to Sparta Rolling Hills Nursing Home, Tomah Masons, Tomah Memorial Hospital, and Tomah Historical Society. The family wishes to express special thanks to the Rolling Hills Nursing Home staff. Memorials may be sent to Sparta Rolling Hills Nursing Home, Tomah Masons, Tomah Memorial Hospital, and Tomah Historical Society. "Email Address" would like to share the life celebration of Israel "Izzy" Cooper. Click on the "link" to go to share a favorite memory or leave a condolence message for the family.